Tips for burning green brush? Discussion in 'Homeowner Helper Forum' started by Okie294life, Jan 20, 2019. I have a huge pile of green brush from a few crape myrtle trees behind my house. I’ve tried diesel, and gas oil mix even the flamethrower to a certain degree and it will not consume it. 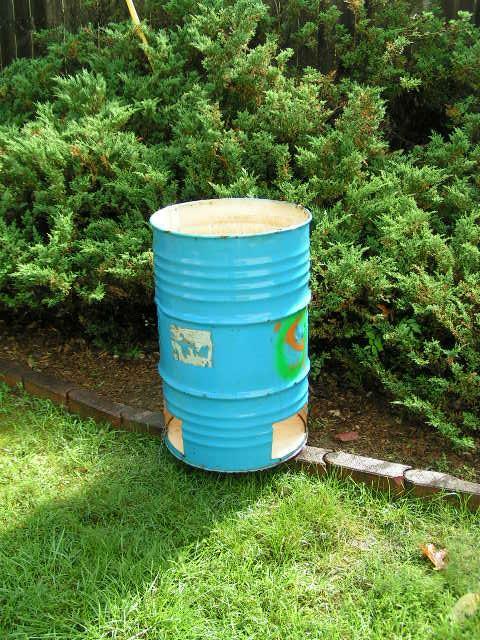 My dad used to use a burn barrel, and excellerant on green stuff, but that was a lot of work. I’ve got a crap ton to consume, so that would take a while. It’s been raining about 2-3 times a week so the stuff is none too quick to dry out. Any suggestions that are legal? I do not plan on burning any tires or napalm. Get a fire going under the upwind side using paper, kindling, dry wood, etc (I have a lot of waxed produce boxes that work great). Then use a leaf blower to turbocharge your fire. bowtechmadman, redlawn 78, Dahmer and 2 others like this. Here is what your burn bbl needs to look like. The 3 large windows in the bottom permit a huge amount of oxygen to be available where you need it, down at the bottom of the fire. You need a good bit of 1" to 3" wood and maybe some 4 to 6" x 12 to 18" wood like dry pine or other like busted up pallets. This wood gets a good hot fire going and then you throw the brush on top and it's consumed rapidly. I use a hole saw to cut four 1" holes at the corners of the windows. Then connect the holes with a Sawzall with a fine tooth hacksaw blade. You need to build a real fire on the upwind side, include some dry wood with your kindling/paper. You need the fire to get going for a bit of time to dry out the green brush then it will burn. The problem with accelerants on green brush is it burns off before the wood can get going. The same will happen with kindling and paper. If you don’t have a leaf blower a lawn mower with the discharge pointed at the fire will work too. You need to get a fire under it, lighting on the upwind side with dry wood is one good way. Another is to get a good fire going and slowly start adding the green stuff to it once it's got a good coal base going. It'll smoke a lot but once you get the green stuff dried out you can start adding a little faster. Burned up the brush from a couple large aspen trees this fall that way. Goes quicker than you'd think once the initial fire is well established. Tarp it for a few months. Green wood and brush etc..... To make it burn, you have to drive out the moisture. Do what you want. But, water don't burn. Dahmer and Jed1124 like this. Got a wood stove, or better yet owb that you could get a bucket full of hot coals from? I burn green branches every other day. You need a a little bit of dry branches or kindlings and a paper. Once you got the dry stuff burning, pour used motor oil on the pile and you're good to go.